You'll be £8.79 closer to your next £10.00 credit when you purchase The Hindenburg Line. What's this? The Hindenburg Line, or Siegfriedstellung, achieved almost mythical status in the minds of the British public: the strongest defence system the world had then seen, scientifically designed by fortification experts with only one aim, to keep at bay the British Army. So pleased and delighted were the British that church bells were rung when the Line was pierced at Cambrai in November 1917. The new wonder-weapon, the Tank, had shown itself to be capable of great deeds and British Generals were seen to be capable of showing the Germans what Tommy could do when properly organised. The initial elation was followed by disappointment as the Germans fought back and the Hindenburg defences were retaken when the Germans used "defence-in-depth" and "elastic-defence", both new concepts to the British who were to learn from their mistakes. The British were to witness triumph and joy again, when, towards the end of the Great War, the Hindenburg Line was to be broken by men from the Midlands. This book examines the reasons for the German's decision to fall back to a strong defence line while their Navy starved Britain into submission, and the "burnt earth" policy of devastation in the area evacuated. 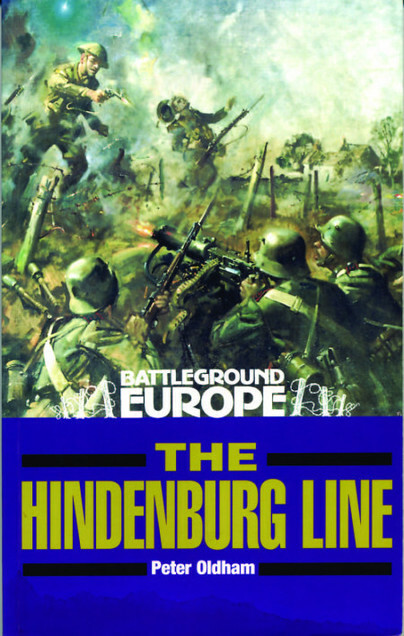 The design and layout of the Hindenburg Line, and the Battles for its possession in 1917 and 1918, are given: with numerous maps covering different sectors and the struggles for each village and farm, together with the part played by many British Regiments. The maps contain information on how to find all remaining vestiges of both German and British defences in the region, most of which are rarely visited and many of which have not been seen by British eyes for many years. No book since the Great War has examined this area in such detail, nor has any single account contained so much for the battlefield visitor to see. The sites of individual acts of bravery, including the winning of many Victoria Crosses are featured, and existing locations of battle lines, headquarters, artillery observation and machine gun posts are also included, together with an absorbing narrative which also guides the armchair reader. Peter Oldham has a special interest in defence strategies and tactics of the First World War, ranging from the grand planning and organization of defence schemes to the parts played by the sapper who dug the trench and the tommy who has to man it. Having studied the evolution and changing theories of fixed and elastic systems, he then researched the part played by permanent fortifications and shell-proof protection for troops and services. His understanding of the problems of the supply and use of building and concreting materials is unrivalled. As a concrete technologist, he has spent twenty-five years testing and producing concrete materials and structures.